Poli or Boli or Obbatu is a traditional flat bread made with all purpose flour and stuffed with a sweet filling. Dhall and coconut filling is the most common varieties made by everyone and it has been a custom at home to make them for Ayudha Pooja celebrations. Dry roast the rava in a pan for a couple of mins and transfer it on a paper. Measure and mix sugar with it and keep is aside. Choose well ripen black grapes. Remove stems and wash them thoroughly. Take the grapes in a large vessel and add one cup of water to it and boil it until the fruits get cooked. 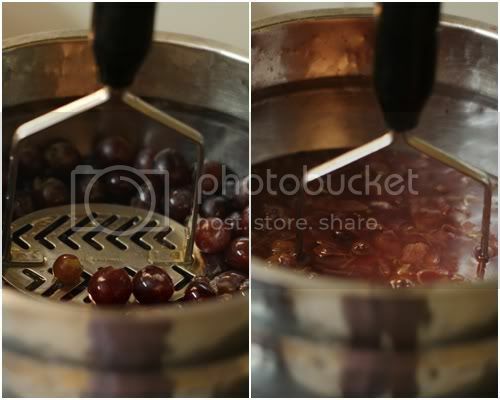 While its boiling, keep crushing the grapes with a masher until it is thoroughly juicy. Strain the extract and collect the juice. Measure two cups of juice and keep it aside. 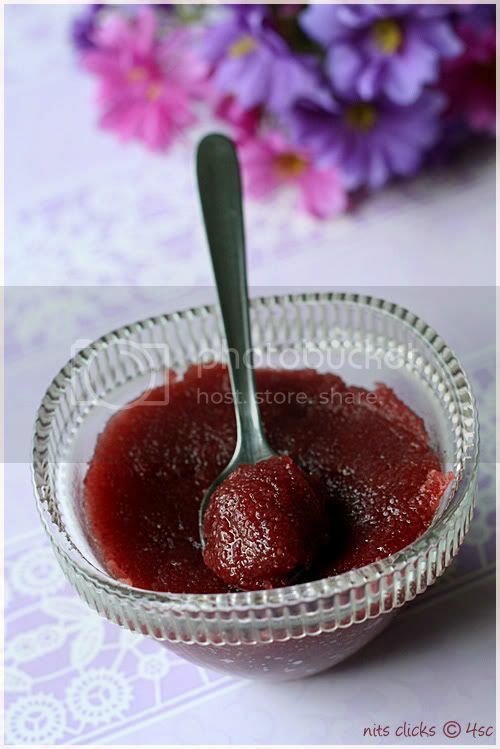 In a heavy bottomed pan, take the extracted grape juice, grape essence and water. When it starts to boil add the rava and sugar mixture stirring continuously. In a medium flame keep stirring it until the semolina gets cooked and the contents roll out without sticking to the sides(Kesari consistancy) . Add ghee and mix well. Once done, leave it to cool. Roll balls of this grapes kesari filling and keep them ready. Mix all purpose flour, salt and cooking soda together. Add adequate water to roll it into a soft dough. Finally add oil and kneed well to make the dough smooth. Roll the dough into a ball and coat it heavily with oil and leave it alone for 3 hours. Take a plastic sheet or kitchen foil and grease it with oil. 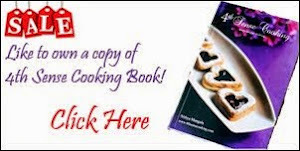 Take a chunk of the wrapper dough, press it out to about 2-3 inches in diameter using your hands. Place a ball of grape kesari filling in the center and fold it from all sides, proceed to seal at the top. Now press it on all sides with your hand to make a boli of 5 inches wide. Carefully remove it from the sheet and toast it on a pan. Flip and toast on both the sides by applying some ghee over it. This quantity would make around 20 polis. Refrigerate and use within 3 days. You can simply make the grape kesari and serve it as it is. The purple shade is beautiful and the aroma and flavor of grapes makes it impressive. Looks like a piece of heaven:) A very innovative Poli and the stuffing itself looks tempting! Very innovative!!! A yummy & delectable & a fun filling to traditional poli!! Lovely and tempting one.. As usual awesome clicks.. Very unique filling ...looks very tempting ...eagerly waiting to try & taste it ..
very innovative recipe dear, feel like grabbing those lovely polis from the pics..too tempting.. Tempting clicks of a yummy poli..
wow, what creativity and beautifully done too. Hats off Nithya !!! Really New idea Nitya. I love the color. happy Dassara days to you. A very good innovation.Kuddos to u and ur nithi.That's gr8 and tempting. 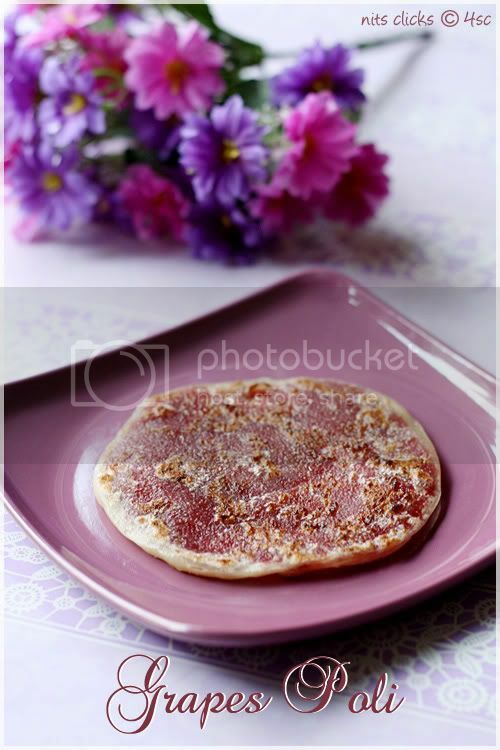 Awesome clicks and super and colourful dish!!!!!! never heard of this filling!something very new and innovative! !wondeful pictures! Adengappa... my jaw was hitting the keyboard and my toungue dangling, dripping.. Awesome pics!!! Lovely innovative sweet..
Boli summa semma perfect a irukku!! I am hosting Fast Food not Fat Foot event. Do check out my event and send me your entries. What an creativity .. fruit as a filling in paratha .. Nice ! What an innovative way to prepare poli.... Looks delicious. 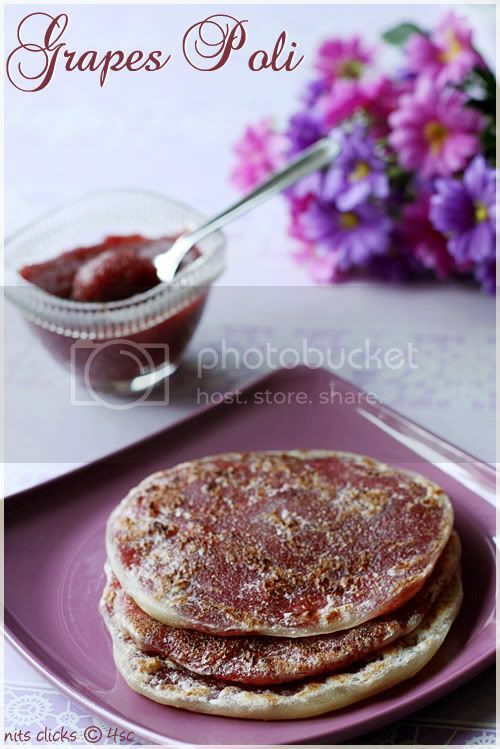 Interesting filling..lovely color of d filling n lovely shots wid very good sense of colors in d background..
Awwww.. wonderful blog, Yummy obbatuu!!! This is truly innovative.. cant wait to try this one! 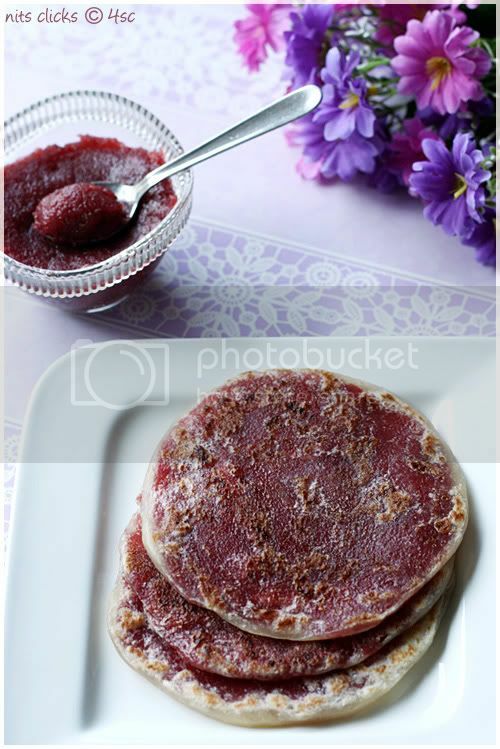 Grapes Poli luks divinely Good and superdelicious click too.Luv following this yumm blog of interesting recipes. Perfect and innovative polis...beautifully presented dear.. When do we get these tasty food stuff??? It looks so yumm!!! Grapes in a poli ?! man this recipe is awesome!!!! Oh..quite interesting..grapes in boli! Like this space for some unusual recipes and wonderful clicks. Am impressed with your innovations. Grapes in a poli is absolutely unique. Love the concept. Its my first time here. U have a gr8 site. 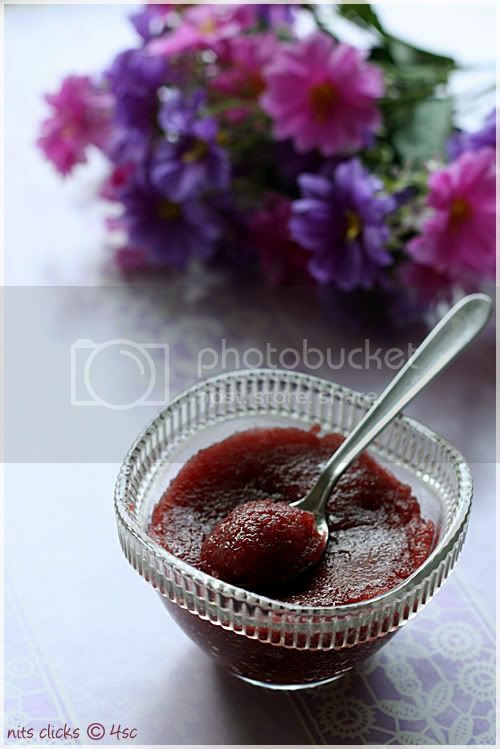 very innovative.. love the purple color of grapes kesari.. awesome clicks.. Very innovative and tempting..Just had the classic poli made by my MIL..will try this out next time..